I am hopping with the Colour Combo blog hop team of independent Stampin' Up! demonstrators today. Our colors for this month are: Gray Granite, Crushed Curry and Rich Razzleberry. For this project focal image I used one of the stamp sets that I won at OnStage called Lovely Lattice which is perfect for coloring using Blends. It will be a free stamp set when you purchase $50 worth of product. Every January through March is Stampin' Up!s biggest sale called Sale-A-Bration where you earn free products for every $50 and $100 you spend and the most exciting part is that there are no limits to how many free products you can earn! I will add these sets to the supplies list once they are available, for now I took pics for you to see what the sets look like. First the image was stamped in Basic Gray. Next light and dark Rich Razzleberry with light Highland Heather filled in the larger flowers and the buds. The small flowers were left white for interest and variation. Smokey Slate light and dark filled in the leaves as well as shadows. I used dark Daffodil Delight for the center of the flowers. The focal and a small accent flower was fussy cut and popped up on Gray Granite cardstock. The sentiment comes from an Occasions stamp set that will also be live in January called Humming Along, It was heat embossed in white. Very thin mats of Rich Razzleberry and Crushed Curry complement the coloring. The stack was then adhered to a silver edged card base which is in the Holiday catalog and will be carried forward into next quarter. Whimsical highlights using a white gel pen gives it a fanciful look. I finished the project with frosted epoxy droplets. Here is an image in artificial light taken at night right after I completed it and the next morning I remembered to take a natural light shot with the decorated envelope. I prefer natural light but then some of the vibrance of the Blends is lost. As you can see in the night shot, the color intensity is highly visible. I love to color and found this image to be a very satisfying coloring image due to its size and subject matter. Flowers are very fun to color! I hope you like my project. Don’t forget to leave a comment before you hop to Tricia and see her lovely project. Just click on the arrow below. If you get lost along the hop, you can use the blog hop list below to help guide you along. Check out my YouTube Channel with over 220 stamping and camping videos to enjoy! Wow! Just wow! Stunning card! 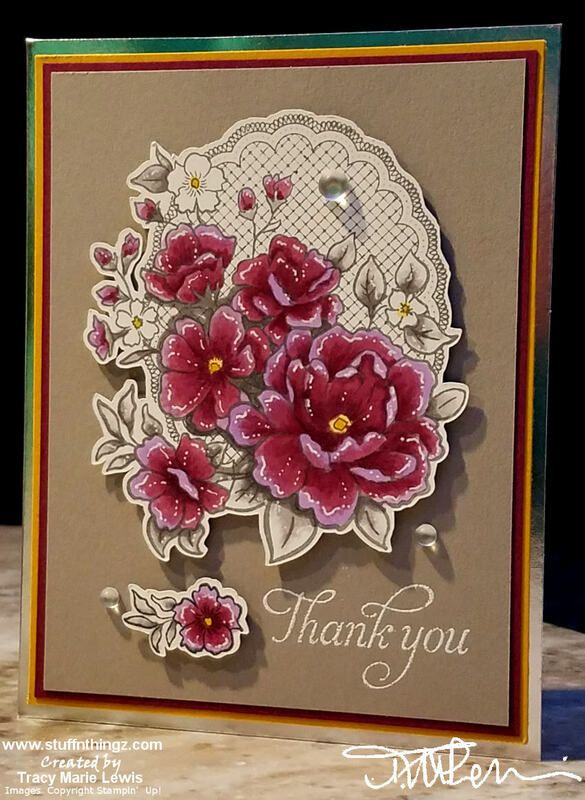 Beautiful card, great coloring and I love the white gel pen you used - looks awesome. Beautiful card - I love how you used the colour combo in your design!